The Mojave Dry Vacuum System utilizes a single-stage regeneration pump driven by a variable frequency drive. The Mojave requires no oil or water and is designed to deliver exceptional flow rates and energy cost savings. The compact unit speeds up or slows down based on the suction needs of the office. The Mojave Dry Vacuum System is low maintenance as it has an automatic rinsing cycle to clean the tank and prevent clogs. It is available in six different models. A master controller is required for every system and can control up to 4 pumps to alternate the primary pump and regulate the speeds of multiple pumps as well as consistently monitor, record and report any system errors found. 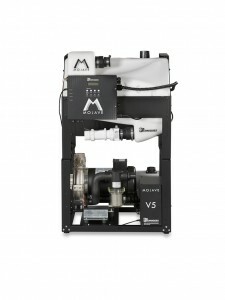 Mojave Dry Vacuum units perform automated self-diagnostic tests every 4 hours on each pump. Each system comes with a two-year warranty for the complete unit and an extended warranty is available. 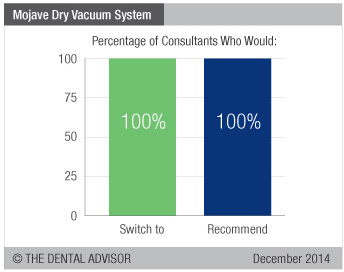 Five consultants evaluated Mojave Dry Vacuum System during a six-month period. 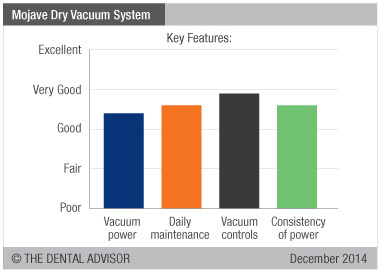 This vacuum system received a 98% clinical rating. 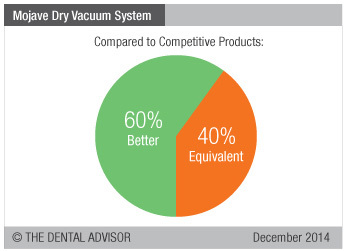 Mojave Dry Vacuum System provided consistent suction throughout the workday. As additional users come online, the variable frequency drive increases, maintaining suction. Users reported it to be virtually maintenance free. 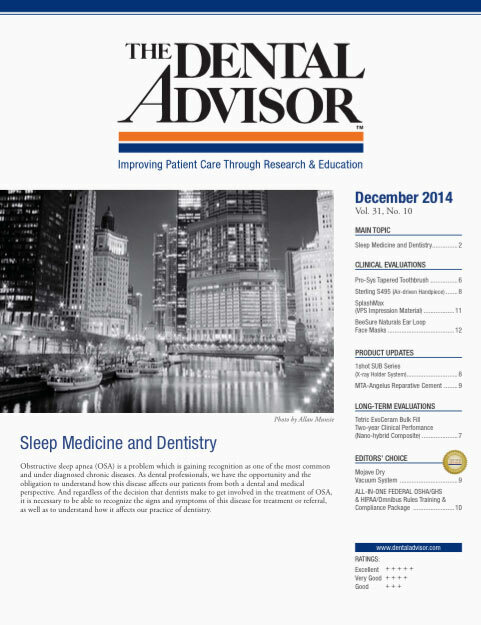 The fact that it worked without having to think about it was a relief to all of the dental staff members. The small footprint requires less than six square feet of floor space. The control panel effectively displays function of the system; no errors were reported during this evaluation.